Dan Kneen's double success at the Tandragee 100 road races was overshadowed by the death of Lusk rider Noel Murphy in the Junior Support race. Racing was delayed for a lengthy period but resumed following a request from Mr Murphy's father who was at the event. Kneen won Friday night's Open race, which was reduced to two laps because of a red flag incident. The Manxman saw off a depleted field to win the feature event, with William Dunlop taking a narrow Supersport win. Meanwhile Ryan Farquhar made history by taking his 200th win on Irish roads on a Paton in the classic 1000cc race, setting a new lap record in the process. The Dungannon rider, who has returned to the track this season after retiring in 2012, also took the flag in the Moto 450 class to take his tally of victories to 201. Race organisers decided to hold the Open race on Friday night because of an adverse weather forecast for Saturday. BE Cookstown Racing rider Kneen came home 0.905 seconds ahead of Mullingar's Derek McGee, with Jamie Hamilton from Ballyclare third and William Dunlop fourth on the Tyco Superpsort 600cc Suzuki. In Saturday's Supersport 600 outing, William saw off the challenge of runner-up Keith Amor by just 0.14 seconds after a thrilling race. McGee was third, with Conor Behan fourth and Hamilton fifth. Following the tragic death of Dublin man Murphy, a number of riders opted not to compete in the remainder of the programme. The feature race was reduced to three laps, with Kneen crossing the line ahead of Shaun Anderson and Davy Morgan. 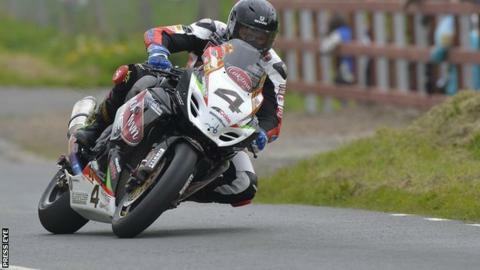 The success followed the Braddan man's dramatic win in the Cookstown 100 race at the Orritor circuit a week earlier. Behan took the Supertwins win, Paul Robinson won the 125cc class and Michael Sweeney was the 250cc victor.